Young people who run the Leicester based charity radio station Takeover Radio took over the airwaves on BBC Radio Leicester. Their aim was to offer presenter Jim Davis a fresh look at some of the issues that are challenging young people in Leicestershire. Four youngsters, aged between 16 and 17, tackled issues such as youth unemployment, student welfare at university and challenged Esther Ranson over the organisation Childline’s relevance, since it was launched 25 years ago. Bradley Foster, Niamh Synclere-Cicinskas, Tyrone Badu and Daniel Leung were on air from 09:00 BST to 12:00 BST on 21 October. The youngsters wanted to bring their own real life experiences to the programme. 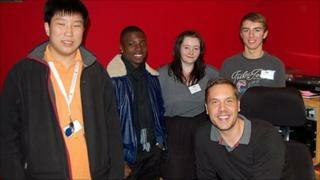 The students also asked listeners whether yound people were doing enough to seek employment? The young presenters took on various tasks on Jim Davis’ programme. Daniel, 17, a weekend breakfast presenter on the charity radio station, said: “I was given the job of being BBC Radio Leicester’s radio car reporter, so I got to go and report from outside of the studio.